I saw this yesterday when Tom & I were at Jones Island so I went back this morning to get a picture of it. 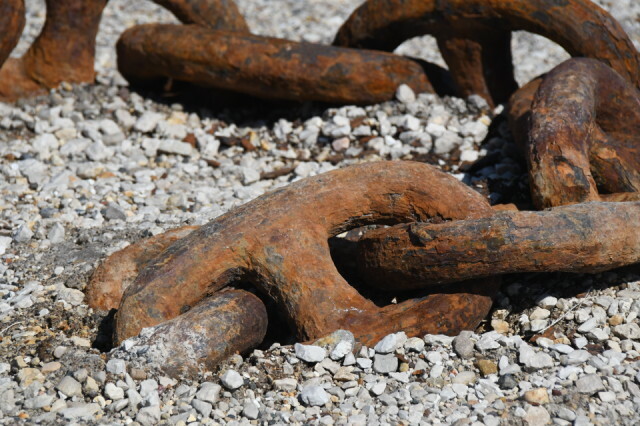 One end of this huge iron chain is very well embedded in the ground, and I think must have been used in the past for docking the ships that wintered there. (There are still a few ships that are anchored for the winter along the Kinnikinnick River, but are no longer brought as far up the river as where I was this morning.) I love all the flaking rust on it. Sunny again today--YAY--but still a bit of a bite in the air--34 degrees (F) this morning. Big thanks to Marlieske for hosting DS!